Did you know that using All Green Carpet Care® can contribute to a cleaner environment both inside and outside your facility or home? In fact, no other cleaning system earns the variety of independent certification and research that our dry extraction process does. 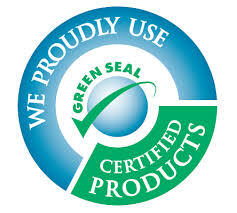 Our cleaning system proudly displays the Green Seal, which is awarded to products that meet its science-based standards of performance, safety and reliability. Because our dry extraction process achieved the Green Seal Certification, you can be sure that it will promote a cleaner, healthier environment, cause less toxic pollution, reduce waste and conserve resources and habitats. Our product is also approved by the Florida School Plant Managers Association (FSPMA) for carpet cleaning products based on performance, safety and environmental criteria.